Based on Clyde Edgerton's best selling novel and N.Y. Times Notable Book of the same name, Lunch at the Piccadilly is about a group of senior citizens who negotiate a surprising new lease on life - and on their retirement home. The songs are by Drama Desk Award winner Mike Craver. Directed by Steve Umberger, the show has been developed at the York Theatre in New York and in productions at Festival Stage, Cape Fear Regional Theatre, Parkway Playhouse, and Blumenthal Performing Arts Center. View the slideshow of one of the recent productions, this one sponsored by Aldersgate ccrc, and scroll for more information. "Put on your distance glasses, take a load off your feet, and settle back to let the good times roll! And will they ever!" "Silly and soulful....At the very moment Edgerton confronts despair and loneliness, those issues turn out to be ripe material for satire." "The themes about family and aging are universal. A funny and heartfelt hit, worthy of its' creators' estimable talents." "Among the delights here are the pointed satire of the nursing home industry...and the chorus of idiosyncratic, opinionated characters who have more life left in them than anyone quite expects." After three productions, the most recent production was an opportunity to collaborate with Aldersgate, a visionary leader in senior living. The six month project, with a staff of 60 professional artists and administrators, and education programs, resulted in a residential uptick from 89% to 96% for the growing ccrc. 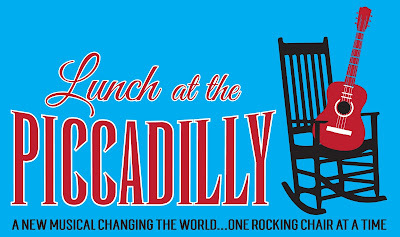 Lunch at the Piccadilly has proven to be a remarkable catalyst for a timely conversation about our growing "elderhood." Clyde Edgerton is the author of ten novels, a book of advice, a memoir, short stories and essays. He has been a Guggenheim Fellow and five of his novels have been New York Times Notable Books. He is a member of the Fellowship of Southern Writers and is the Thomas S. Kenan lll Distinguished Professor of Creative Writing at UNC Wilmington. Below, Edgerton talks about developing Lunch at the Piccadilly for the stage with director Steve Umberger. "The musical doesn't shy away from truths about old folks. It puts us inside their heads with gentle and broad wit and a tougher kind of wisdom...A flavorful, diverse score that touches on arcana but more often touches the heart." Lunch at the Piccadilly is available for licensing. Find out more on the Contact page.